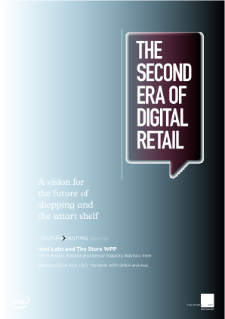 Shopper expectations are evolving faster than retailers are innovating, and over-capacity in the retail sector has put shoppers in control. Shoppers want their needs met faster. They are demanding more efficient, higher quality, personalized, and omni-channel shopping experiences. They want products and services tailored to their individual tastes and desires. They are demanding increased ...transparency into pricing, retail operations, and products, and want a bigger say in how products are developed and sold. But retailers have been slow to innovate and are furiously discounting as they fight for every dollar. The spaces they occupy are too big and in the wrong places. Urbanization is only piling on the pressure. Unless something changes, the race to the bottom is on. Technology will remake the face, the bones, and the brains of retail. Specifically, computing capability will come at costs, physical sizes, and performance levels that will quickly disrupt retail. Historically, retailers have focused IT spending on the "bones" of retail: manufacturer-facing efforts designed to optimize the supply chain, manage inventory, and handle secure transactions. In response to new shopper expectations, retailers are rebalancing their IT spend to include customer-facing technologies that improve the "face" of retail: technology to improve the shopper experience, to make mission shopping more efficient, and to make experience shopping more enjoyable. Computers that can see, hear, and understand the world around them will enable brands and retailers to hold new types of interactions with shoppers, and tell stories in new ways. Wearable computing will help shop assistants deliver much better customer service. Giant data centers will amplify the effectiveness of both the "bones" and "face" by connecting them to the "brains" of retail: analytics and intelligence at every stage of the retail machine that multiplies the effectiveness of the bones and face. This added intelligence will help retailers drive operational efficiency, better understand their customers, and deliver personalized experiences, personalized offers, dynamic pricing, and customized products and services. In the coming decade, smart cars will navigate down smart streets in smart cities. Smart products will be delivered by smart trucks to smart stores inside smart packaging. These smart products will create new revenue streams built around new business models that enable retailers and manufacturers to build new service businesses. Smart stores will be filled with smart infrastructure and smart shelves that bristle with a myriad of sensors that gather vast amounts of data. In-store automation will free up labor to focus on customer service and enable human touch connections that can't be replicated online. Giant computers will analyze this data so retailers can optimize operational efficiency, gather valuable insights for manufacturers, and deliver compelling personalized experiences to shoppers.